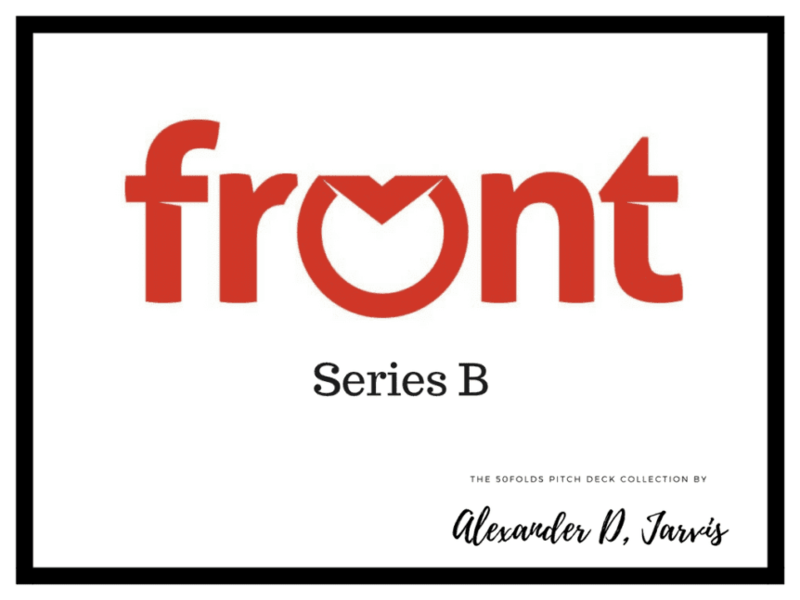 This is the Front series B pitch deck used to raise a $66m round led by Sequoia and followed by DJF. 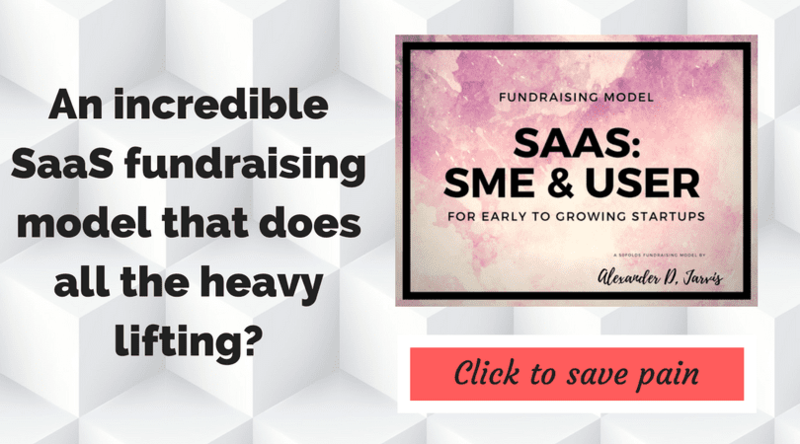 They were founded in 2013 and have raised $79m to date. You can read about the fundraise here. 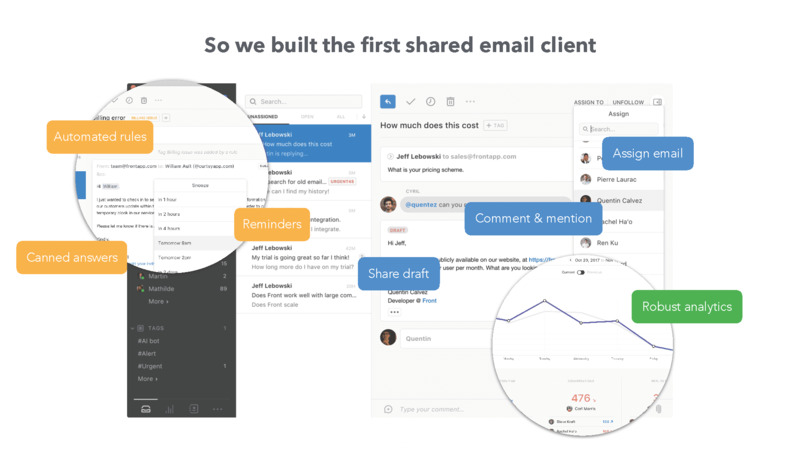 Front redefines work communication with the first shared inbox for teams. 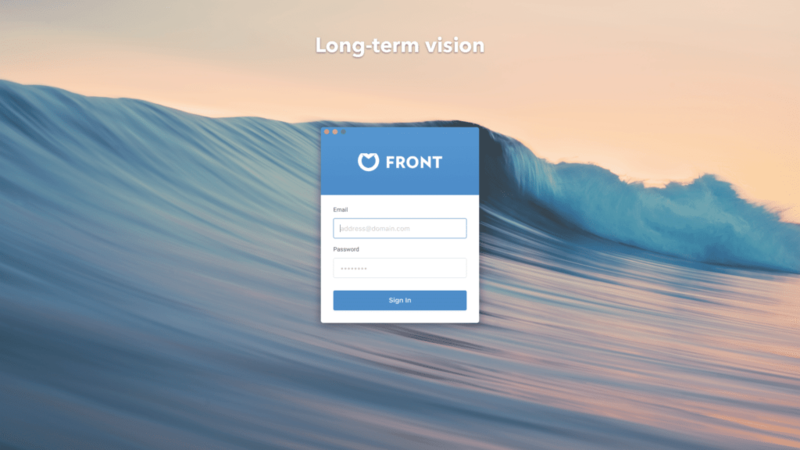 By unifying your email, customer communication channels, and apps in one platform, Front helps teams collaborate efficiently and have more context and visibility into every conversation, to work faster and better together. Today, more than 2,500 businesses rely on Front to power their work communications. 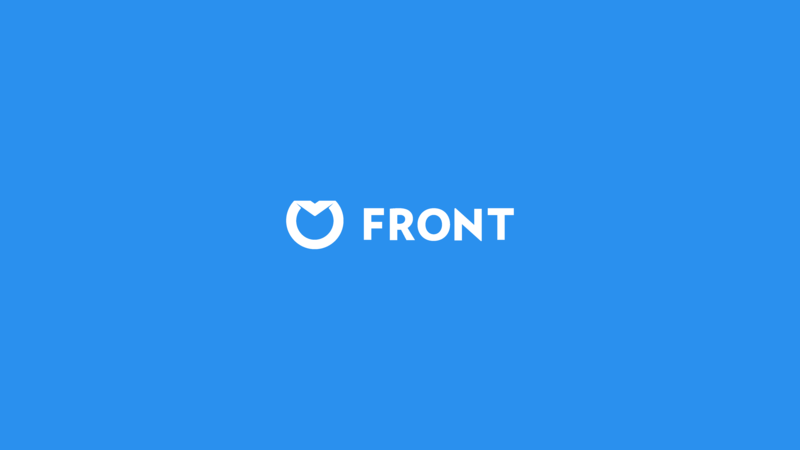 Founded in 2013 by Mathilde Collin and Laurent Perrin, Front has raised $79 million in venture funding and has 50+ employees in its San Francisco headquarters and Paris, France office. 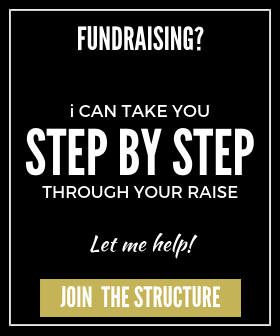 A few investors had mentioned in passing that they’d be interested in leading our series B — and I believed them, so I decided to initiate a fundraising process. A few weeks later, we had raised $66M, led by Sequoia and followed by DFJ. I don’t have enough experience to draw general conclusions as to why it went well, but there is one thing I’m pretty sure has helped: I leveraged my existing relationships with one partner in each of the VC firms, to be able to get a partner meeting right away. Building these relationships happened over the course of Front’s entire existence, so in effect, it took me 4+ years to secure this funding 🙂 Build relationships early and maintain them regularly, but keep it short and focused (I usually meet with each firm once every 3 to 6 months). We’ve painted an ambitious vision. We’re in the best position to execute it. Front is a “system of engagement”/”system of work”: people spend a lot of time in the app every day, doing a lot of meaningful actions. We’ve grown a lot in comparison to the money we’ve spent. We’ve been very efficient. The results have been very consistent. The cohorts’ evolution is strong. ASP is growing and larger teams are using Front. Lead generation results are promising. We have a truly special team. Portfolio companies using the product had great things to say about it. Last but not least, apparently I did a good job at explaining Front. 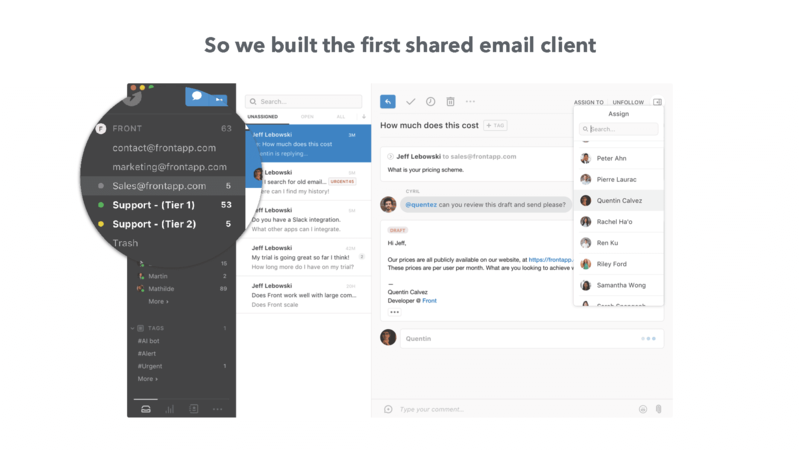 Clarity of communication is apparently something many founders struggle with. Make sure you are an expert at explaining and selling the opportunity in your business. The average selling price (ASP) is still low. The self-served portion of the business is not that high. Our gross churn is a bit higher than we’d like. The net number of customers we add every month has been constant. I didn’t provide any guidance on valuation, and simply asked that investors give me a fair price. That combined with a very short process helped make the round competitive and eventually played in our favor. I had all the data investors might ask for, and was constantly sending it over to answer the questions they had. That streamlined the process and helped keep the momentum going. I did a ton of back-channeling to pick our new board member. Board members sit at the board longer than employees stay with the company: background-check accordingly ? Let’s go through the deck slide by slide. The first slide is clean. This is how I like it. I personally like adding a brief tag line so an investor knows what they are getting here- at least sector wise. This is the series-B and Mathilde knows the investors already, so a lot of this can be taken for granted. If you’re doing your deck, I would do similar. Keep it simple. 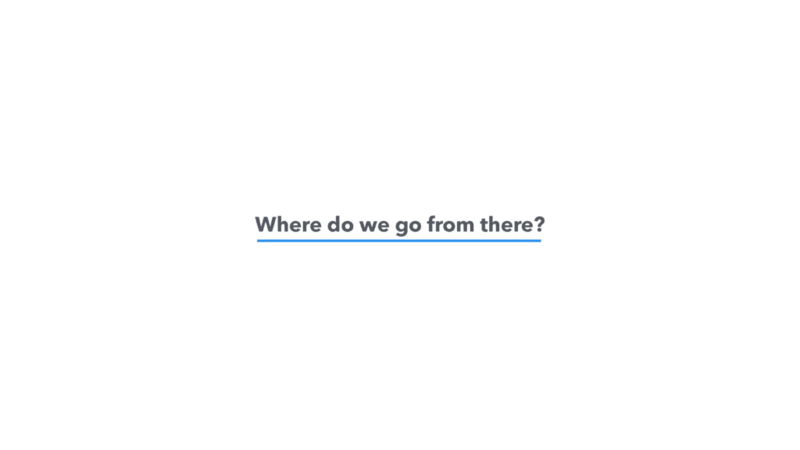 For the second slide of the Front series b pitch deck, I always want startups to say what they do in a sentence to make it really clear. I get decks where I read it and I’m not sure what it is they exactly do. I actually had one such deck come through today which this applied. That’s so painful. You want to ensure 100% investors know what it is you do. Of course, Front don’t need to spell this out. The first slide explains the problem in a sentence, in the header. The supporting images and copy explain the problem from the perspective of customer care. People email, who manages the responses? The issues to the business are then spelt out in the bottom blue segment. To the untrained eye, you may not appreciate it, but this is an incredibly well-done slide. 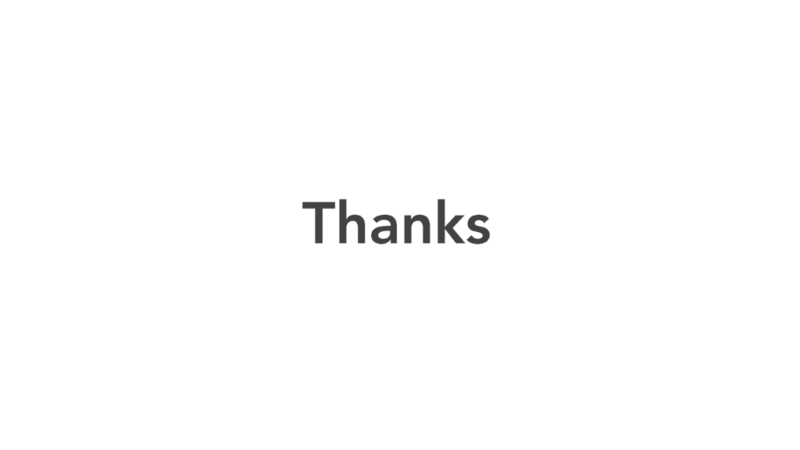 Simple and communicative is very hard to do. Simple is the ultimate sophistication. The story immediately proceeds to the solution. They saw a problem and they built a solution to that. Defining it as a ‘shared email client’ is pretty smart. I bet they spent some time figuring out that term. Or maybe it took 5 seconds, either way, it’s very descriptive. The solution is actually also the product slide. The next one drills into it. The first one zeros in on it being an inbox. The next slide shows the product features. 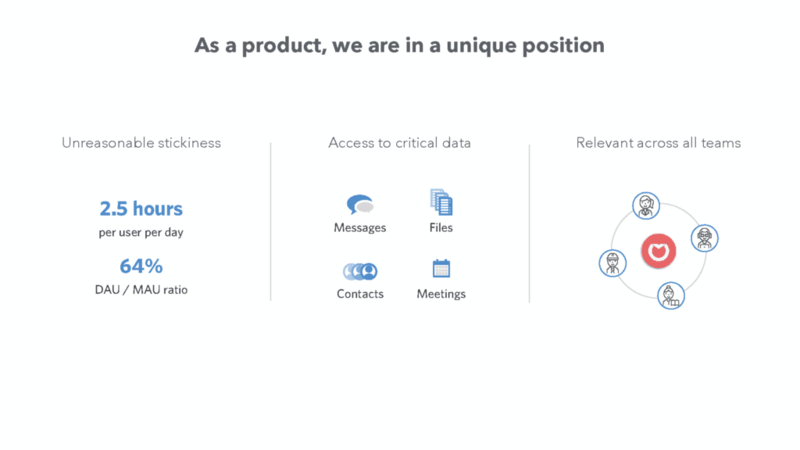 The product slide is often done very poorly- often it’s just a dashboard picture… anddddd that’s it. You aren’t really spelling out what the product does for the investor. The slide is done well. There are three benefits broken out into segments in orange, blue and green. It’s not super clear to me what the categories mean (there could be a legend), but it’s a nice touch to try break them up. Surprisingly there is no actual feature to do the magnifying thing they do. It’s a screen shot they edit. Just, FYI. The narrative then continues with them explaining how they took the core product and then expanded the ‘value proposition’ along three dimensions. 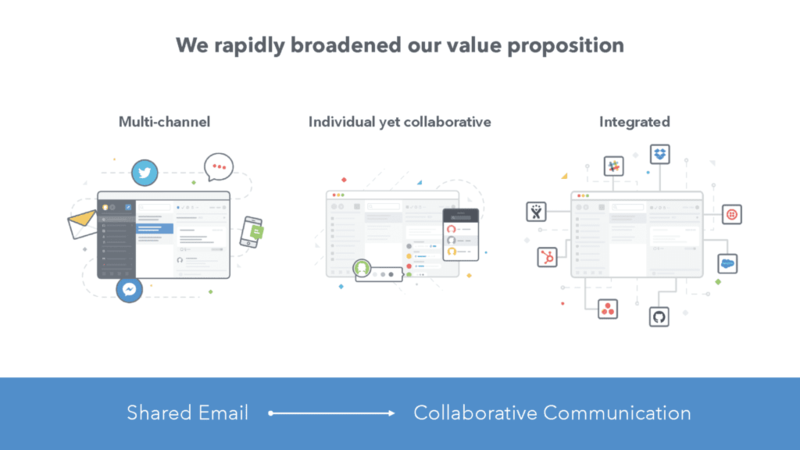 The blue box illustrates they moved from an inbox into collaborative communication, which sounds Slack like? 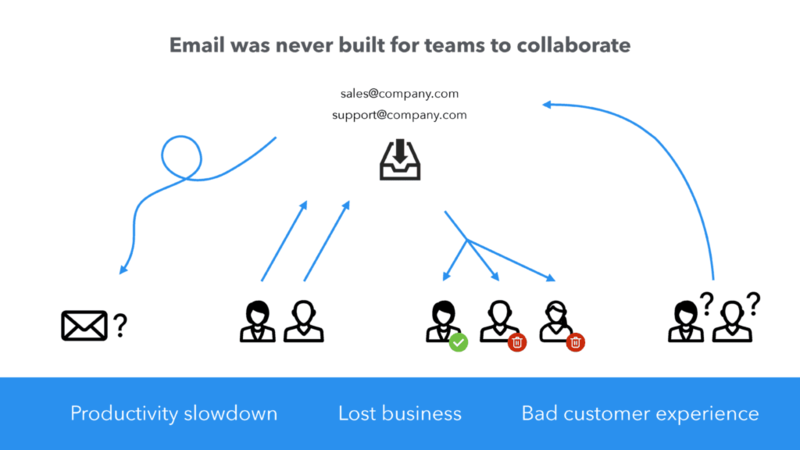 The take away from the blue box is that they are migrating from just email to collaborative communication. She uses the blue box to illustrate an insight. You could also just use a sub-header, which I typically do, but this feels quite clean. 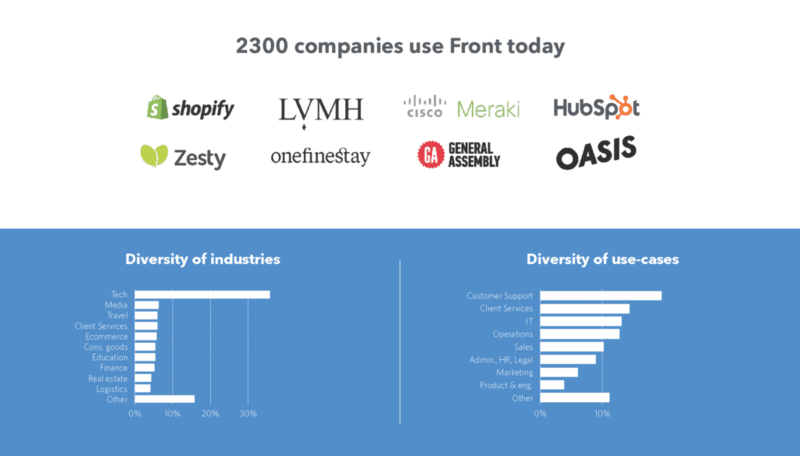 After they explain how they have expanded, they move nicely into customers with ‘2300 companies use Front today‘ and a bunch of pretty logos to make them look important (Always be selling!). This is a nice move into traction, which is of course key for a Series-B company (Numbers matter more the later stage you are since it’s not about selling the BS dream anymore!). You don’t want to waste too much time on basic stuff when you are later stage. They are heavily tech-focused, but they set out ‘diversity of industries’ since maybe this is a concern they had. They also have ‘diversity of use cases’ which was, I presume, to show they weren’t a niche provider. Having moved into customers, it’s natural to dig more into their traction, which they do with revenue. They present their ARR as opposed to their MRR. I don’t know what their average contract length is. 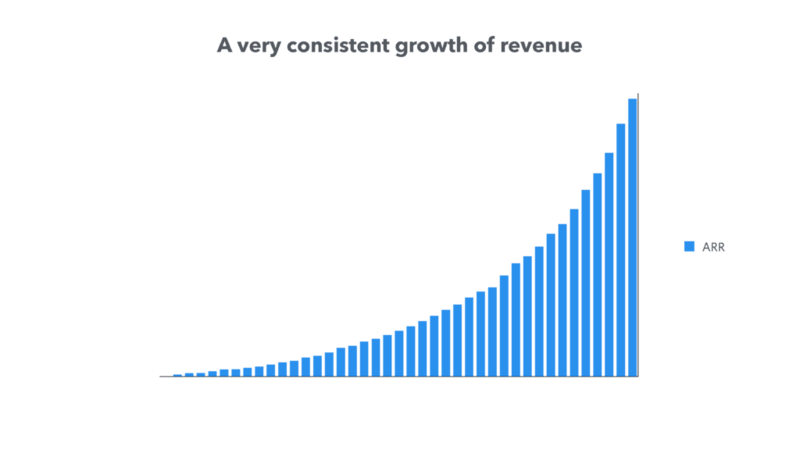 The headline is ‘a very consistent growth in revenue’ and consistent with SaaS revenue is so very key. The graph is very smooth and VCs love that. VCs like ‘predictable’ and not large swings in numbers. Next up is churn. You want churn as low as possible- the max is around 3%. The axis are redacted, but my guess is each bar is 5%. I tried comparing their S-A graph against the S-b and they don’t quite match up, but maybe the data proved to be different. So my guess is their gross churn is around 4% and their negative net MRR churn is about 4%. 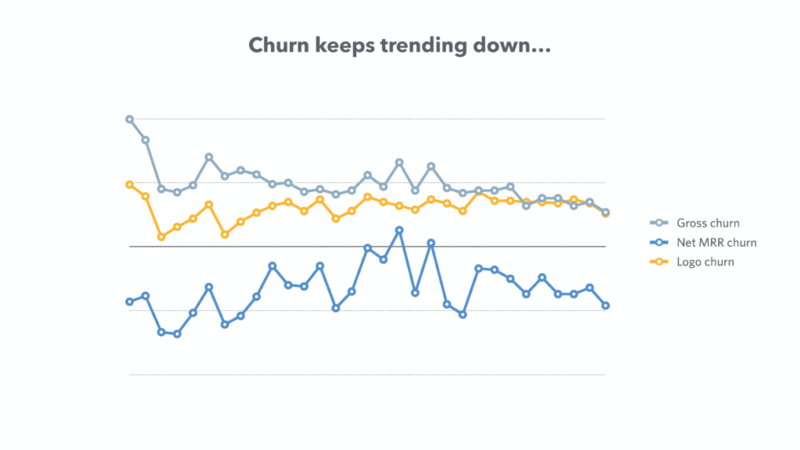 Now, gross churn is fairly high, but negative net MRR churn is really good. What this says is they are churning out ‘logo’ customers at a high rate, but expansion MRR is compensating well (put another way, they are losing # of customers, but making more $ from customers). This is good and bad. 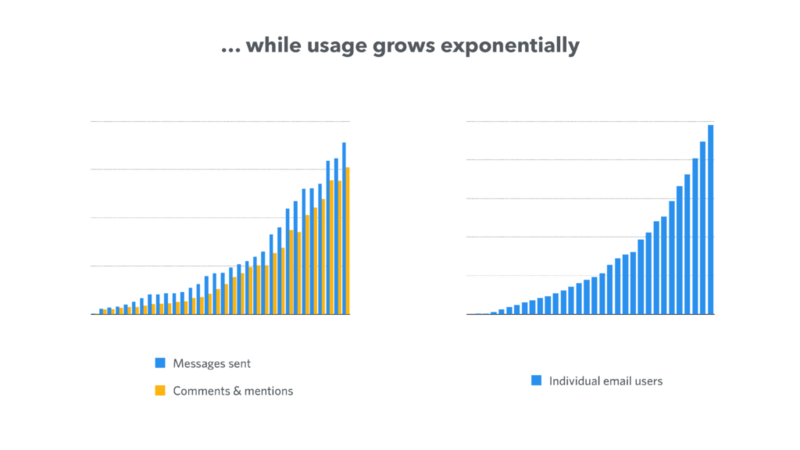 Following on from the churn they link into usage growth. It’s like they are offsetting churn with the fact people are using the product more. That’s a good pairing! It’s a little hard to draw meaningful conclusions from this without a priori knowledge, but things are going up and to the right, so, eh? They’ve shown that they’re growing so now they migrate into how they are going to scale. 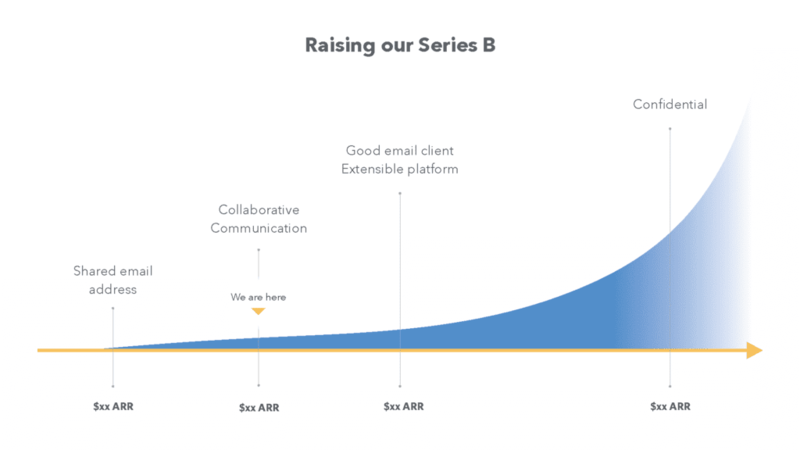 If you’re an investor at S-B stage, you want to know how they are going to do it? If they’re taking on a sales team it means they want to migrate into larger accounts, which needs a sales team (generally). They haven’t figured this out as they are spelling out they are building a sales ‘growth engine’ by hiring staff and illustrating their ability. 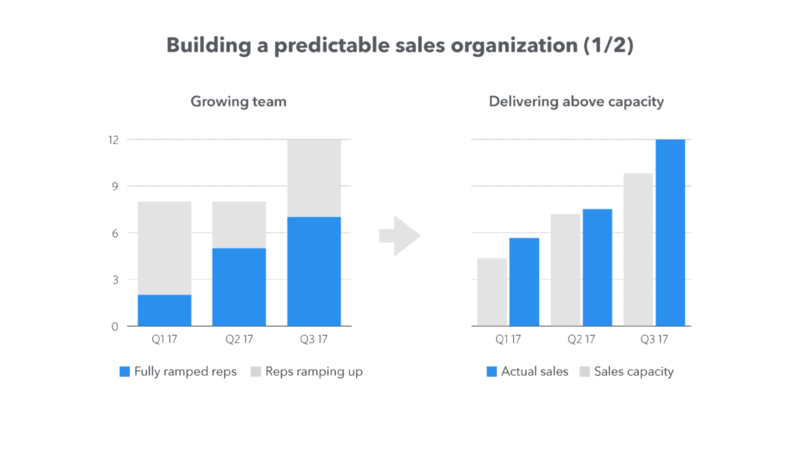 Firstly, they show they are scaling up their team and the theoretical capacity and then they are presenting the fact that existing sales staff are exceeding their OTE by the fact that actual sales are larger than sales capacity. Illustrating this is not easy, and it’s clear they are digging deep to figure out their selling points. These slides aren’t perfect, but it’s really good hustle. 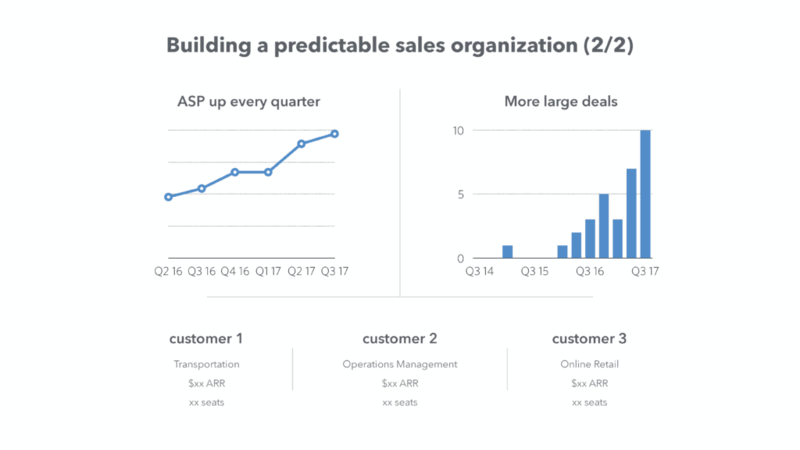 This slide builds on the previous one to illustrate how they are building their sales growth engine. The ASP or Annual Sales Price is growing and that they are progressively getting larger deals. It’s clear this is still a work in progress. I don’t quite get the customer 1/2/3 but at the bottom but it’s their to support their initiatives. Understand decks are really hard to get right to sell your story, but you can see how much thinking is put into everything. 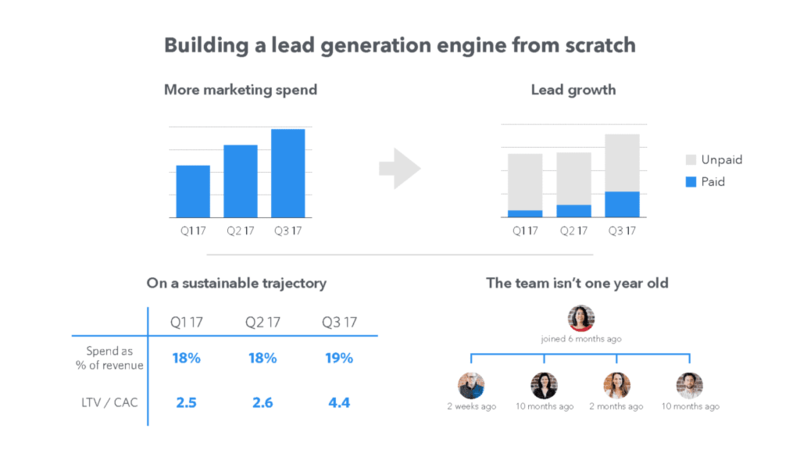 The focus on scaling continues when they show that marketing spend leads to lead growth. This feels like a weak slide but they’re trying to show what they are doing and even admitting their weaknesses. This is admirable as if you don’t state your demons, investors are sure as hell thinking about them! ‘The team isn’t even one year old’ is a testament to the fact. Cohorts are of course something that is going to be reviewed. These basically say for a period of time, typically a month, how does that ‘cohort’ of users perform? So let’s say one month you acquire a bunch of users from Groupon, then the cohort will appear smaller over time because they are rubbish users and the churn out. Now declines in cohorts are pretty normal. But in this case, these are dollar based cohorts as they are getting larger over time. 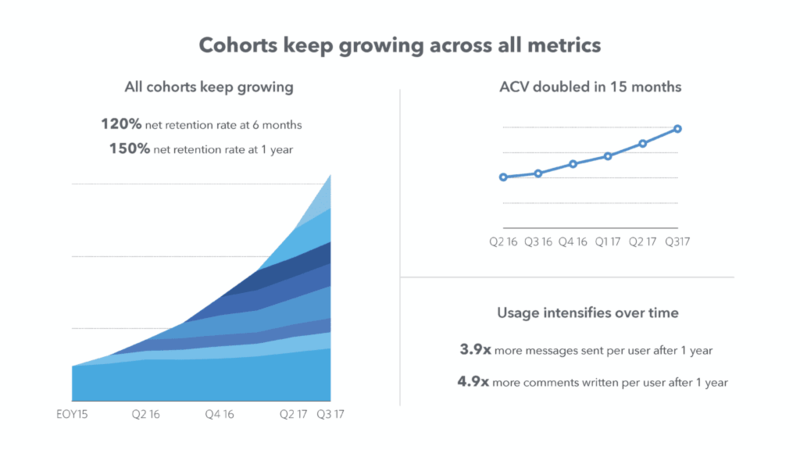 In fact, in 6 months the cohorts are on average 120% larger, meaning there is account expansion (customers are paying more money over time). This is very good. Their ACV (Annual Contract Value) doubles in 15 months which is positive too and supports the cohort data. The reason they are making more money is that usage increases over time, and therefore they have more paying seats. You can see that 4x more messages are sent after a year and 5x more comments. So over time, more people in the organisation use the product more. So obviously, if people find the product useful they are going to start using it more and pay more. As they are growing, Front wants to show that they are scaling well. 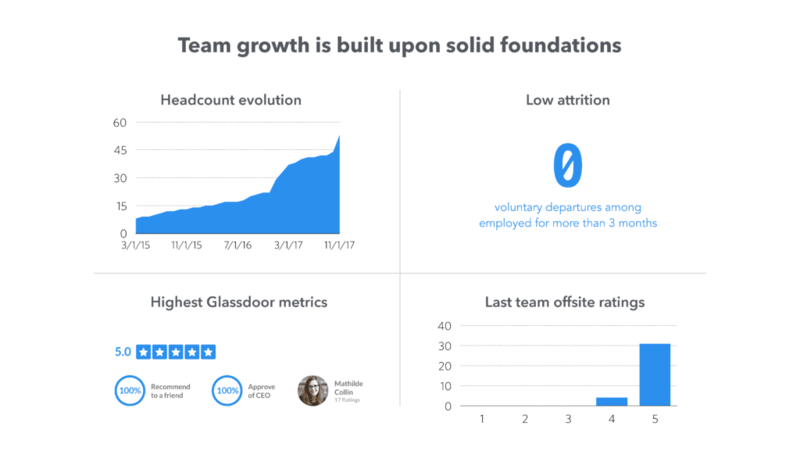 In around 2 years they have increases headcount around 5x with zero ‘voluntary’ churn in staff (They fire people, people don’t quit). Glassdoor (which is a fab treasure trove for due diligence) also says flattering things from the stats. It’s not often that one sees this, but they include a poll that the team rank the firm mainly on a 5. I rarely see this slide, but it’s a nice touch. VCs love you to raise money from them so they own more of your company, but the love you to spend that money well too. 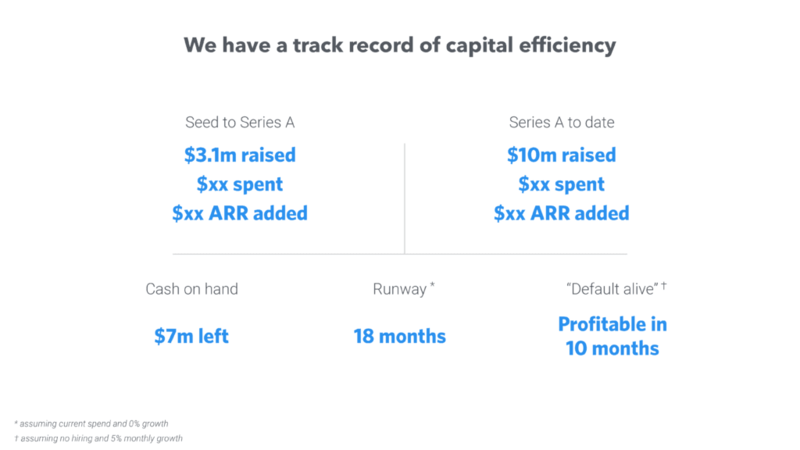 ‘Capital efficiency’ is VC code for not blowing their money. 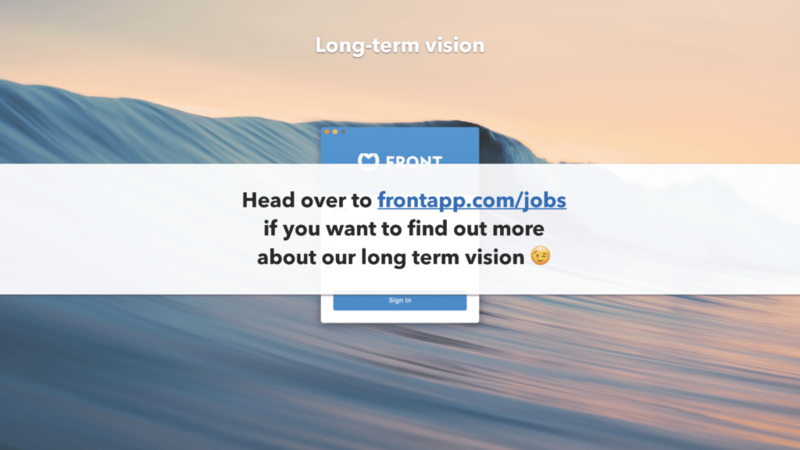 Front did this in their last pitch deck too, they showed that they are raising and haven’t spent all the money from their last raise yet. Default alive means that they could be profitable and self-sustaining, rather than reliant on VC investment crack. If you are spending more money then you are making then you are ‘default dead.’ Pretty much everyone is default dead these days. Another little pro tip to notice is the footnotes. They’re in about size 8 font and in grey. This is something typically only investment bankers do. It’s worth noting and applying yourself. I find this slide a little hard to understand. They’re positioning themselves for the future but letting investors know they are already in a good place. So whilst cash in the bank is going down, their ARR is going up and to the right. 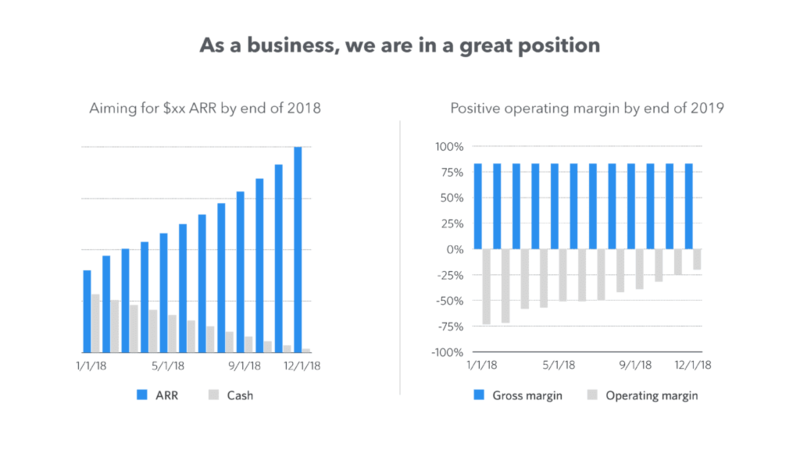 Next, they show that their gross margins are holding but that their operating margin is trending towards positive and will hit break even by the end of 2019. Who doesn’t like profits? So why would your gross margin remain constant but your operating margin increase over time? Well, the fab thing about SaaS is that you have fixed costs, but your variable costs are relatively small as you scale. This isn’t always true with say, ecommerce companies. So as Front scales they can spread their fixed costs over more clients and revenue and the variable impacts them minimally. The more revenue they make the more that flows down the P&L to the bottom line. A less scalable business might not necessarily see such changes in their operating margins (due to variable costs etc). I don’t want to make this an accounting class, so I thought you might like a few quick lines about what is happening there though. This is the only ‘interstitial’ slide in the deck. You should only really have these when your deck is say an ‘information deck’ and it’s 40+ pages. That way you can break up aspects of the information you are providing, or help structure the flow when you narrative doesn’t naturally progress over that long. I don’t really know why they need this slide, but it’s not terrible. It’s just saying that was the past, let’s talk about where we are going now and why you want to be on board. The last real slide said the business was in a good place and now they are asserting the product is also in good shape. They’ll then proceed what they intend doing with the product and this adds credibility they will be building new things and not refactoring technical debt. I don’t really like superlatives and one of the few times Mathilde uses them is in ‘unreasonable’ stickiness. You need to be able to back up these claims. 2.5 hours or use a day and daily to monthly use of 64% is very solid. Of course, if they have users using this just for customer care then 2.5 hours isn’t necessarily surprising, right? It’s the tool for CS. Various times they assert the tool isn’t just for CS though and they do it again mentioning it’s ‘relevant across all teams’. This slide isn’t just about the product though. This is also a special sauce/defensibility slide. They have ‘access to critical data’ which implies that the more one uses the product, the more data is tied to the system, therefor making it sticky as the switching costs are high. Whether or not that is true, it’s a nice point to try sell to VCs. This slide is a little peculiar as the next slide is a replication. The only reason I can think there is a need for this is you are selling something big and you don’t want to get into the details quite yet. 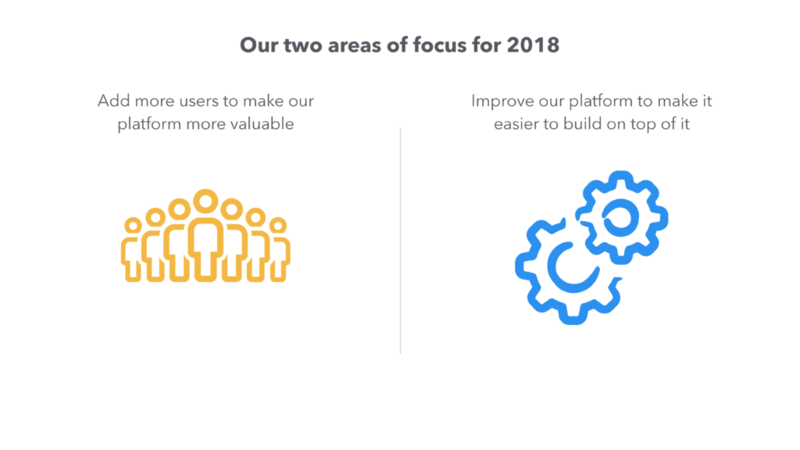 My guess looking at this slide without knowing about the second one is that 1/ they want to make network effects and 2/ they want to build an ecosystem on top which is pretty common goal these days (e.g. Slack). Following on from my brief comment, this is the same slide before but with details about what they intend doing. 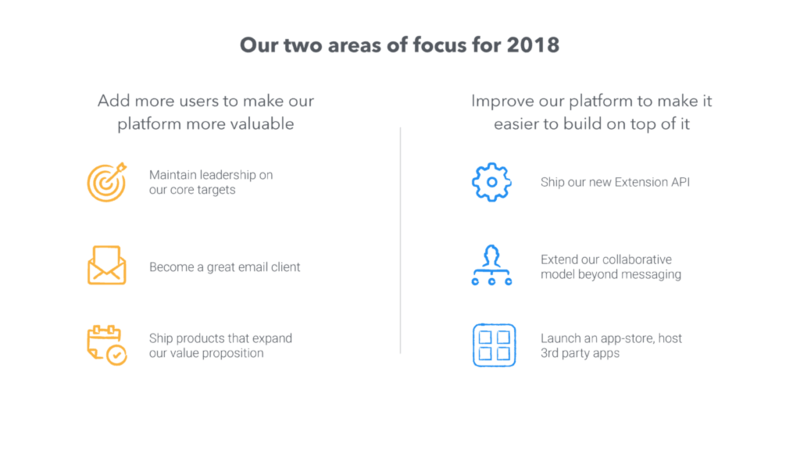 This isn’t just a list of features on the product road map. There’s strategic thought here (remember this is a sales deck and to be always be selling!). They want to ‘maintain leadership’ (asserting they are the leaders) and ‘expand our value proposition’ so the size of the business becomes larger. Most founders would just list things they intend working on. The whole app store thing is a nice touch if you can pull it off. It adds real network effects and therefore another zero to your valuation. A good take away here though is how focused the slide is. Some of the pitch decks founders send me are painful, just endless BS bullet points. Less is more. Be focused. Use the rule of three! Seriously, I’ve reached out to maybe 60 founders to try get their pitch decks for you. No one will share. That’s so dumb! I get millions of views a year from the decks I post. That’s totally free PR. Hey, if you can get me some decks to share, that would be super, so everyone can benefit? The slide is sort of interesting because there is the thought to add where they came from not just where they are going. There is a progression. They start with the fact they commenced as a shared email address and then progressed to the current of a collaborative communication medium.